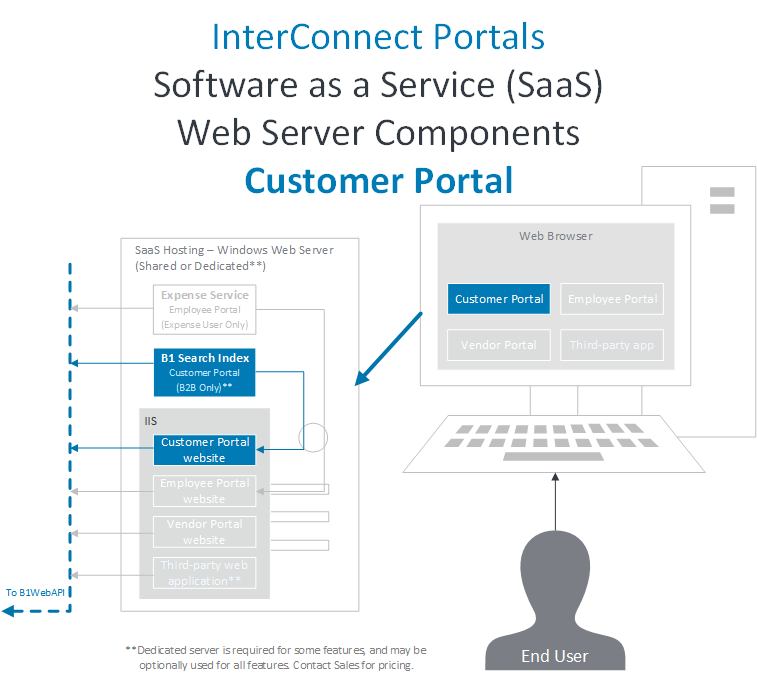 The following diagrams outline the recommended system architecture for Portal and Interconnect implementations, including common SAP Business One arrangements. 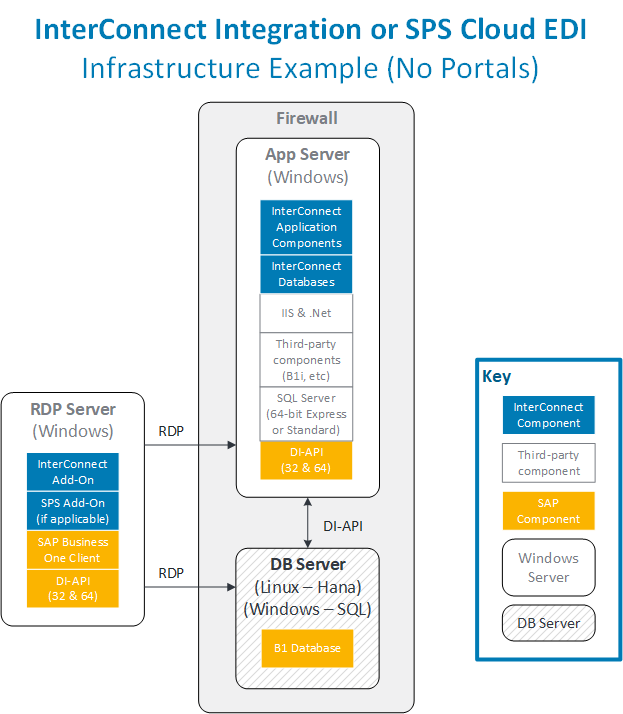 Infrastructure Example - InterConnect, Portals or SPS Cloud EDI - SQL or Hana database. 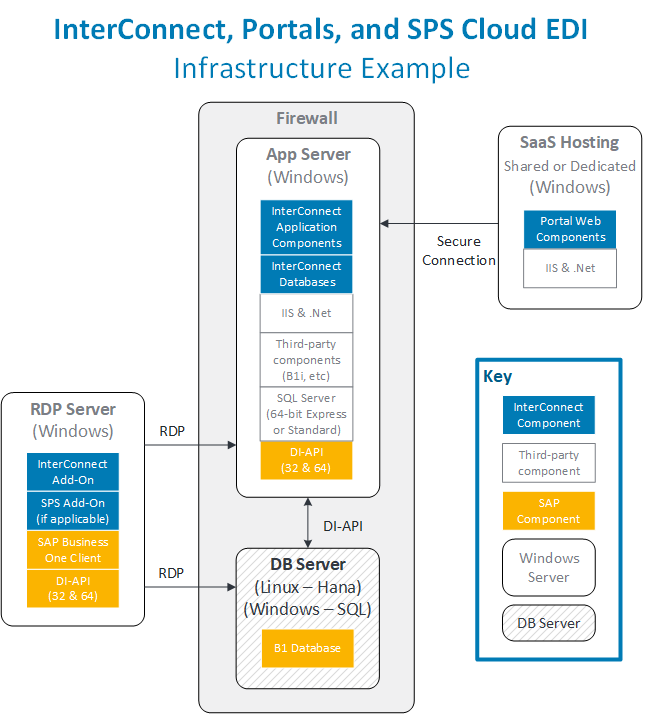 Infrastructure Example - InterConnect Integration or SPS Cloud EDI (no Portals)- SQL or Hana database. Hosts Windows-only applications, including InterConnect server components, B1i components and other third-party Windows applications needed for B1. This is required for both Hana and SQL database versions. This requires a Windows Server. * Note: Hana B1 databases require 64-bit Microsoft SQL Express, Standard or Enterprise to be installed on this server. Ports are closed to the general internet (i.e. “Behind the firewall”) for security purposes. Ports 4000 to 5000 must be opened to permit access from the Web Server. Hosts SAP Business One Hana databases. This requires a Linux Server for Hana environments or a Windows Server for SQL environments. No InterConnect components are installed on this server. SAP Business One components are as required for a SAP Business One implementation. Allows access to the B1 client and internal resources via Remote Desktop Connection. Permits or rejects incoming connections. Used to restrict access to sensitive business data. 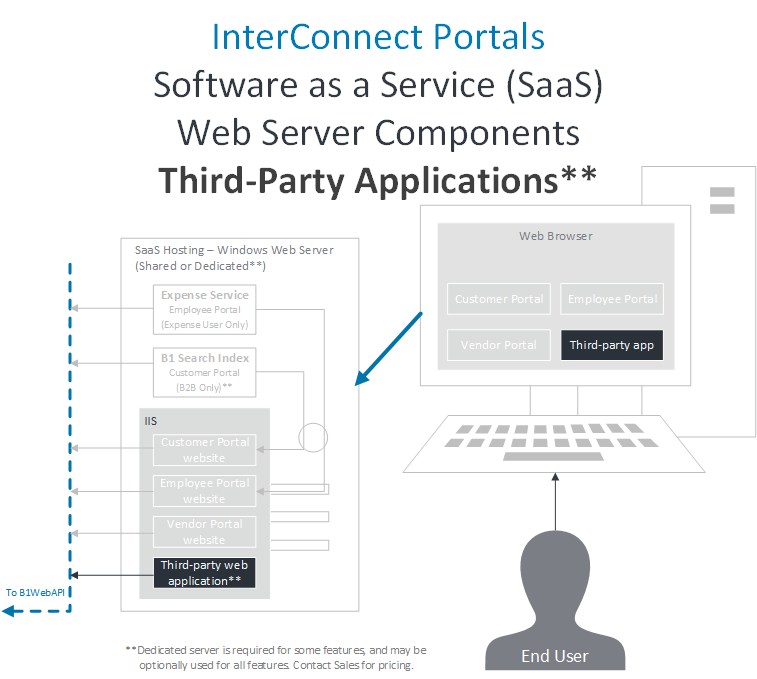 Hosts InterConnect Portals or third-party web applications. No SAP Business One components are required on this server. SSL Certificate is required per domain. 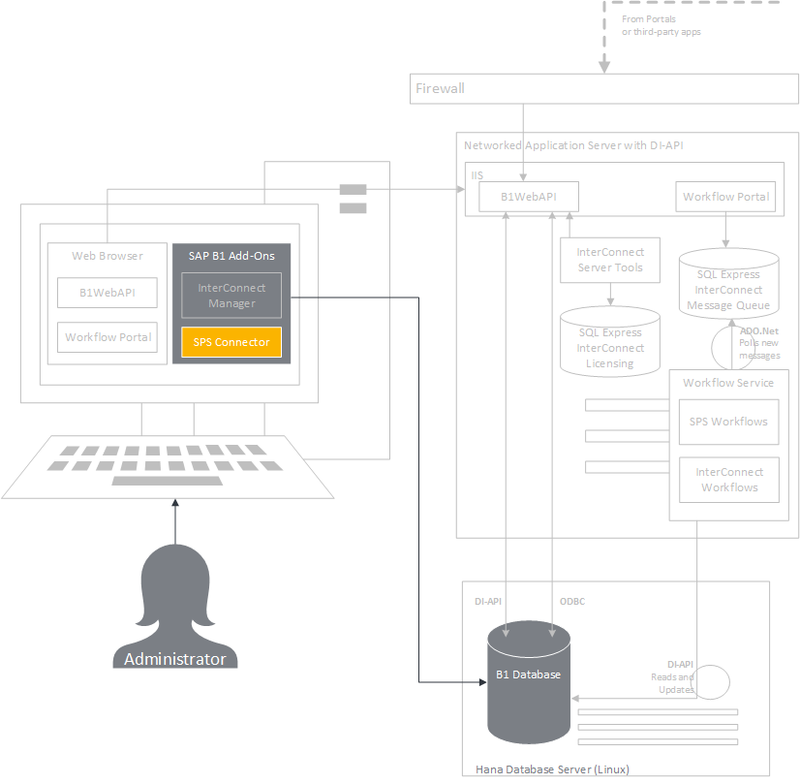 SAP Business One Server infrastructure architecture for Hana environments. 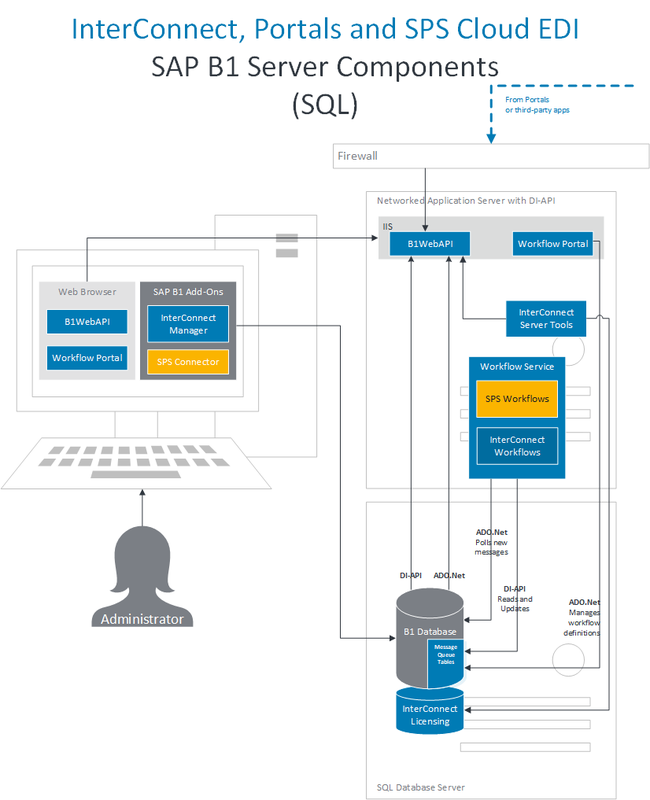 SAP Business One Server infrastructure architecture for installations against SQL Server. 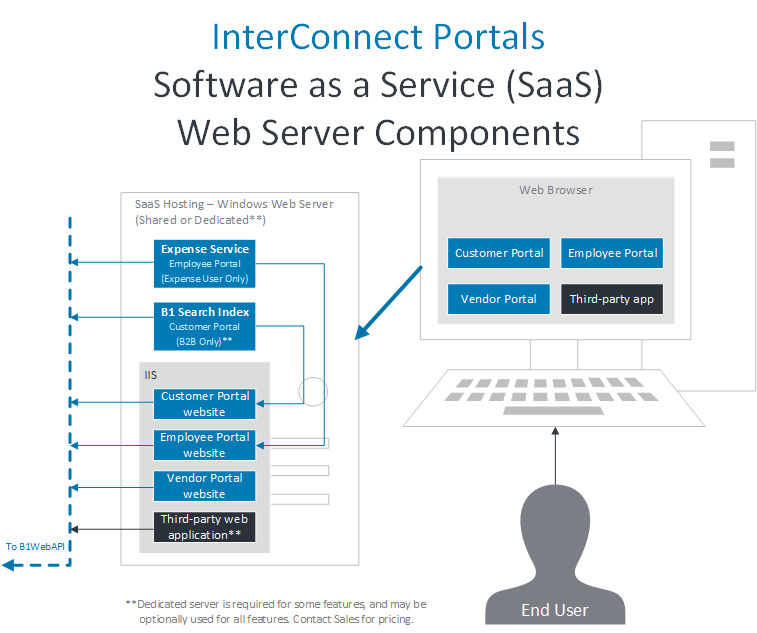 Each of the Portal websites resides on a standalone web server. Each of the Portal websites access SAP Business One data through the B1WebAPI. InterConnect Manager Add-On for SAP Business One is responsible for managing each Portal's advanced settings, as well as user and menu configuration. 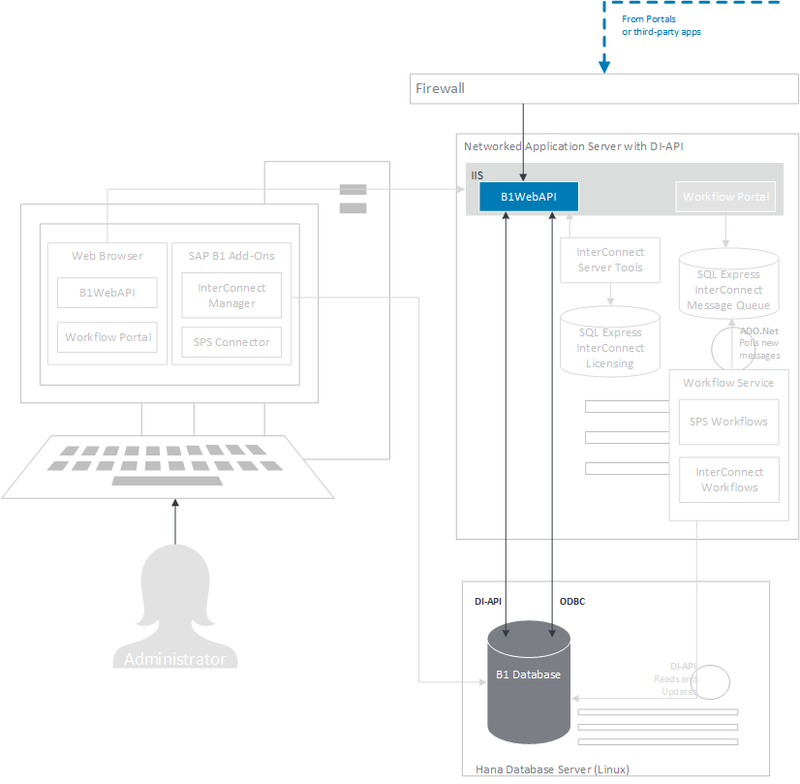 Shown here: Web server architecture with Customer Portal components highlighted. Customer Portal accesses SAP Business One data through the B1WebAPI. 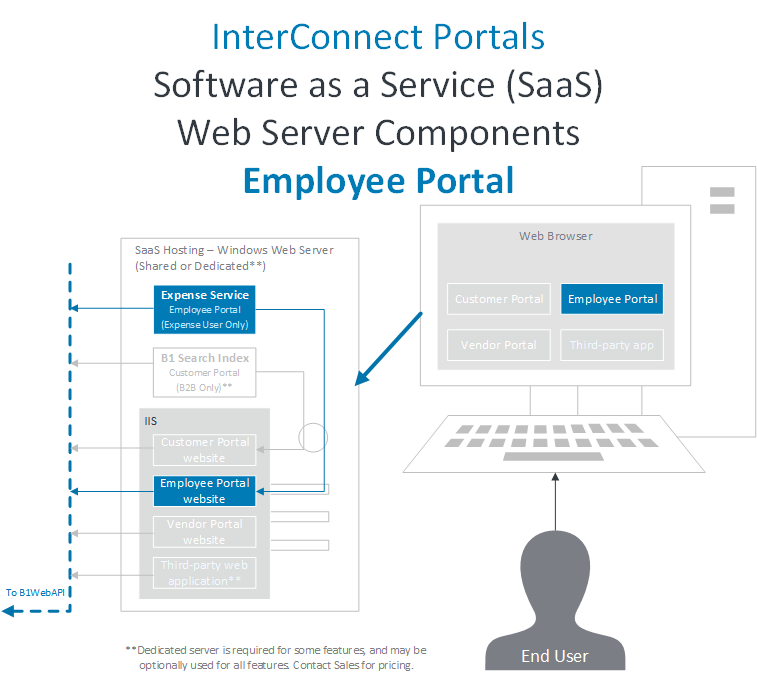 Shown here: Web server architecture with Employee Portal components highlighted. Employee Portal accesses SAP Business One data through the B1WebAPI. 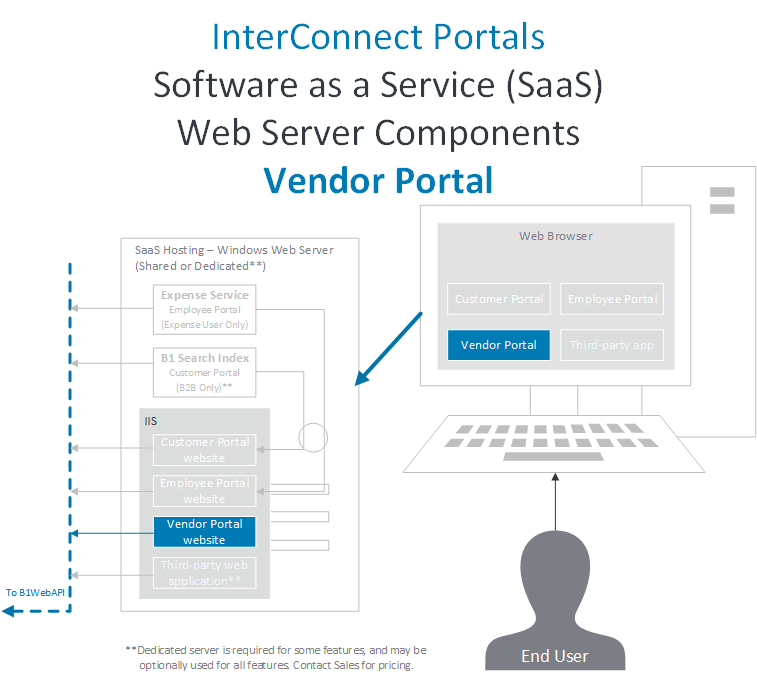 Shown here: Web server architecture with Vendor Portal components highlighted. 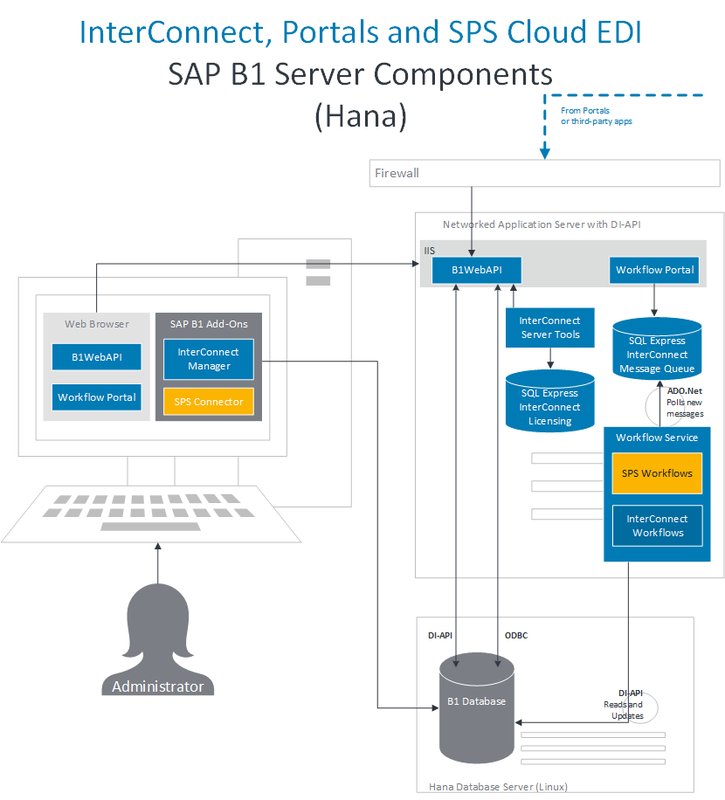 Vendor Portal accesses SAP Business One data through the B1WebAPI. 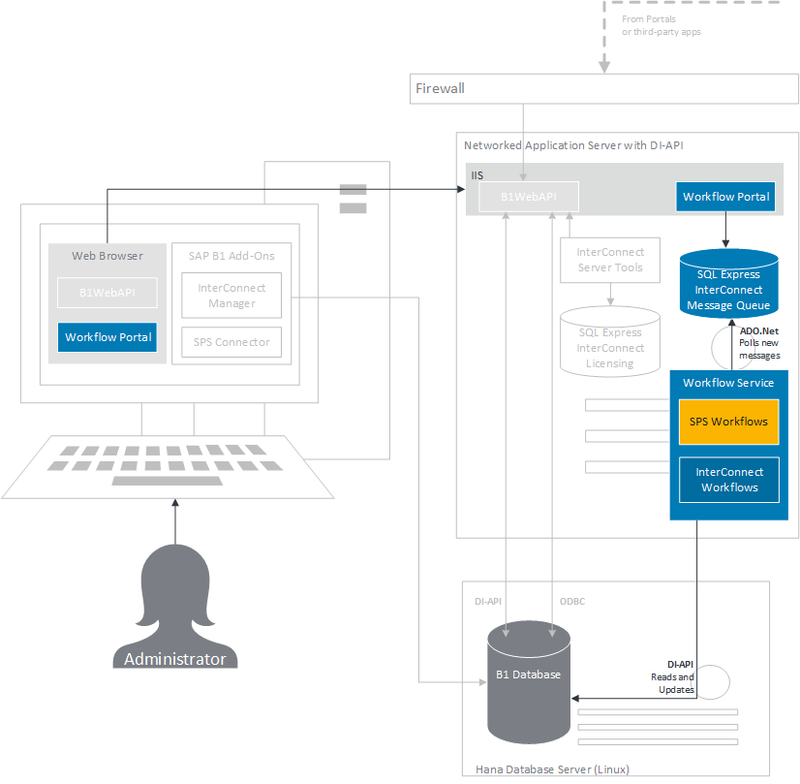 Shown here: Web server architecture with an example third-party application highlighted. When using the REST API, a third-party application may use B1WebAPI to update and read SAP Business One data. Workflow Portal may be used to manage asynchronous data access for third-party or custom applications. An admin may troubleshoot data access issues by accessing B1WebAPI directly. SPS Connector Add-On for SAP Business One is responsible for managing EDI document processing and config settings within SAP Business One. 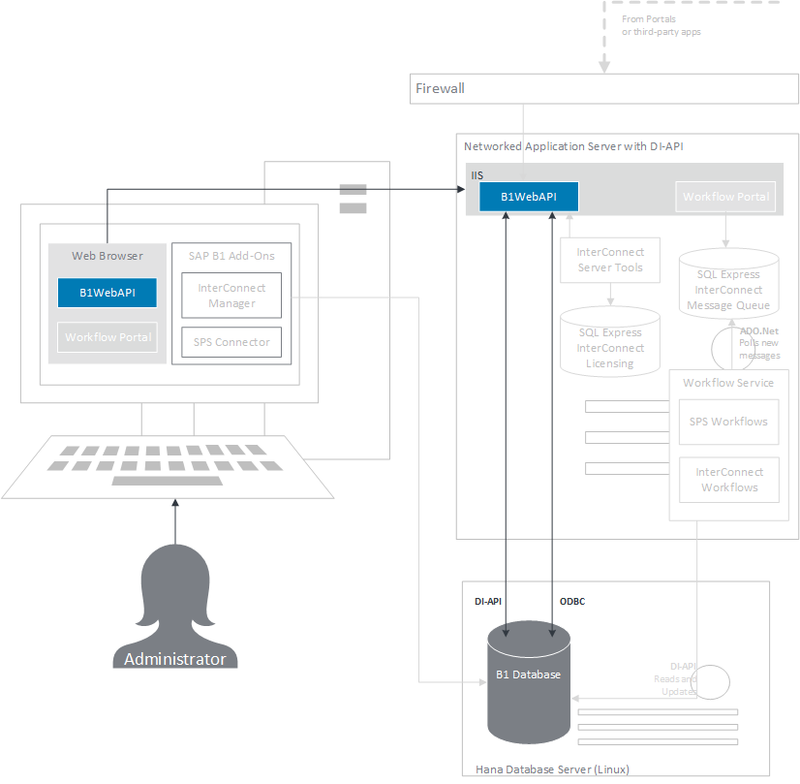 SPS Cloud EDI uses Interconnect workflows to manage EDI transaction processing. This may be done using the website (shown) or within the addon (see previous diagram).